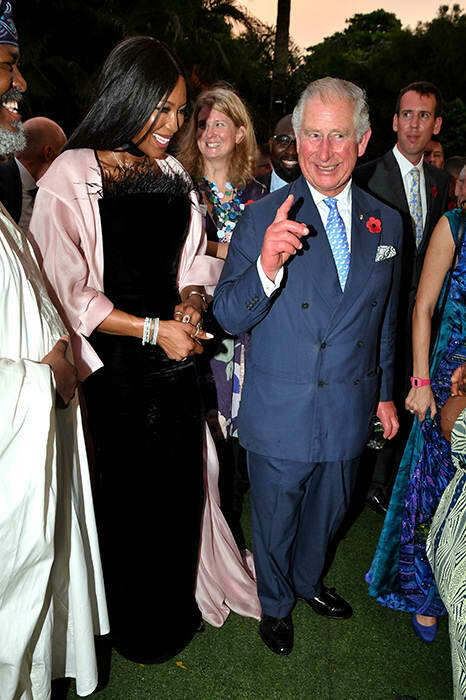 Naomi Campbell, with his Royal Highness Prince Charles were seen mingling together at a reception in Nigeria. The event was held at the British Deputy High Commissioner's Residence on day eight of Charles and Camilla's tour of West Africa, and was attended by key figures from Nigeria's fashion world. Naomi looked stunning in a black feathered strapless dress by the designer Ralph & Russo, paired with a beautiful pale pink jacket and black choker necklace. Naomi's gorgeous dress is from the Ralph & Russo SS18 Couture Collection. Divine! The model's jacket is actually a blush pink 'gazar opera coat'.